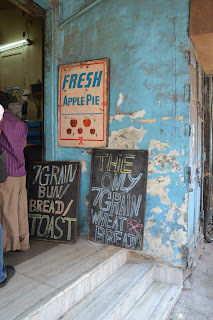 I signed up to join The Fort Food Walk that Kalyan of Finely Chopped fame had organised and duly set off on Saturday morning for our meeting point - The Bombay Store on Pherozeshah Mehta road, Fort, Mumbai. 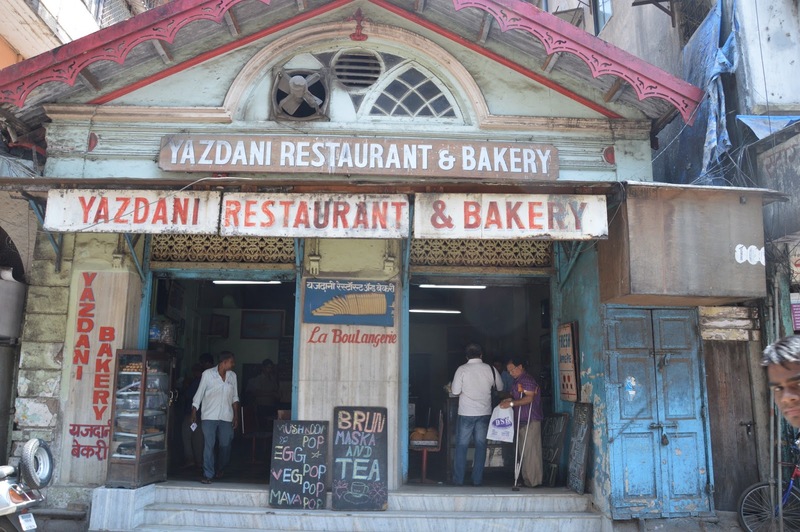 After an hour of a friendly session of getting to know each other we set off to our first food destination of the day, Yazdani Bakery. This place is not new to me. I've been here quite often with the hubby to buy bread for ourselves and even for our catering orders. 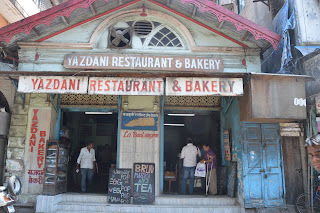 We sourced our bread from Yazdani for many of the years we catered at the different clubs and gymkhanas in South Bombay. The older generation was in charge those days and now the next generation is in the hot seat. Nothing else has changed though. As we approached the bakery that wonderful familiar smell of fresh baked bread and the sweet smell of yeast hit me. Oh the memories! Quick dashes on the scooter with the hubby to grab sandwich loaves before the evening rush at the PVM Gymkhana, or sometimes just dropping by to see the new varieties that they were adding to their menu, sitting for a cup of tea and a bun maska and catching a 15 minute break in the middle of a crazy day, or just driving past the bakery and yelling hello to them as we passed by. Here I was at Yazdani again! 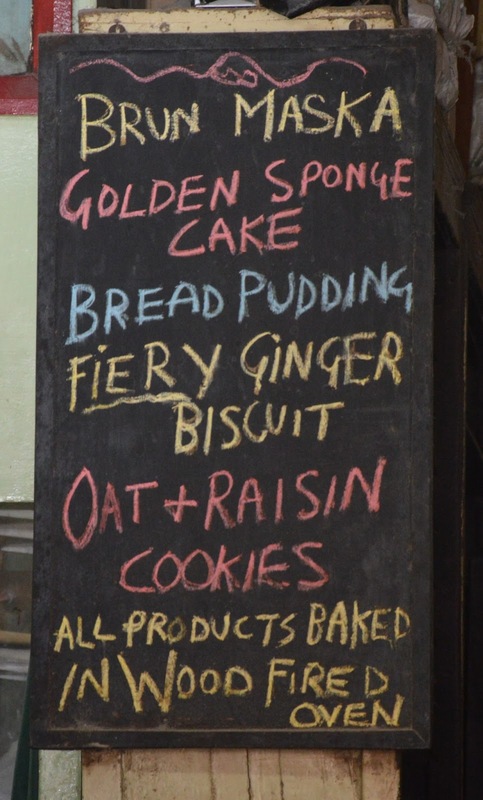 We all trooped in to the bakery and made ourselves comfortable at the tables. Bun maska, brun maska, chai and biscuits were ordered. And we waited in anticipation. Well, not quite! Many of us whipped out the cameras and began to take photographs of the goodies that were all around. 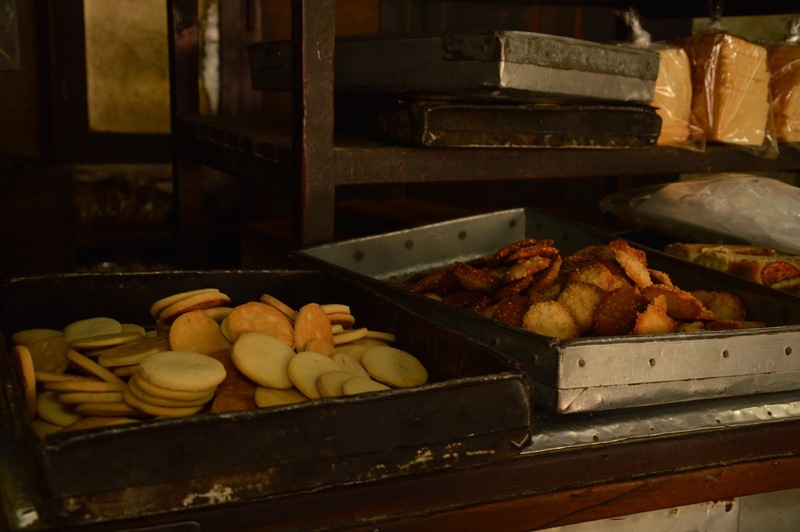 breads, cookies, the slicing machine, a tray of beautifully browned bread pudding, the tea pantry, another tray that had slabs of butter neatly arranged, waiting to be slathered on to the buns and bruns that would be dished out.. there was a delightful picture wherever you looked. Once the appetite for carbs and fats were satisfied, we were taken to the inner sanctum for the ultimate treat - a peep into the the actual bakery where all the real magic happens. It was unexpectedly large, much larger than I expected. One doesn't realise quite how large this building is considering its relatively small facade. There were piles and piles of baking rays and loaf tins. In the centre of the room was a table that is probably as large as your bedroom. Weathered, scarred and even broken at a few places, it was beautiful. I couldn't resist.. I reached out and ran my hand over the surface. 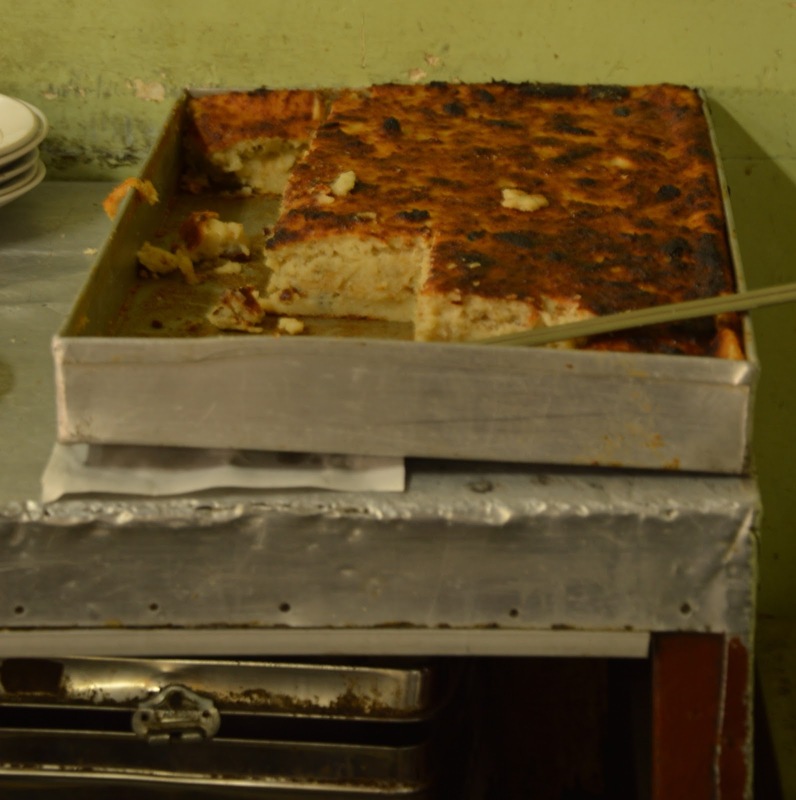 Smooth as silk, I could feel all those mounds of dough that had been kneaded and worked on it. I felt happy. 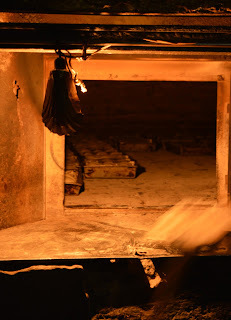 The entire group of fellow walkers were clustered around the tiny door of the main oven - that massive wood fired beauty that is fired up at 3am every morning and doused only at night. That oven bakes as many as 150 trays of bread at one go! Trays of pau were being loaded in to bake as were clustered around to watch. There was a massive gleaming stainless steel clad very modern electric oven just next to the wood fired one. No one seemed particularly interested in it. I guess it just couldn't compete with the cavernous monster that seemed to have an insatiable appetite for the trays of bread that were passed into its mouth! Once we'd finished gawping we trooped out and geared up to go to the next food stop on the itinerary. I stopped to take a few pictures. The best part of my Yazdani experience was to follow. Now the Iranis who run these bakeries are legendary for the excellent quality of their products and their total lack of manners or grace towards the clients. I was in the shop clicking away when an old gent walked in to buy some bread. Old Man - Arrey, the soft buns are not available on Sundays! Owner - No. They're not. Old Man - But why not? Owner - (snarls) - Yes! Everything comes to an end! (points to the shop) This will end. I will end. YOU will end. So what am I to do?! Old Man slinks off quietly. My Yazdani experience was complete! Rhea I must say that I was a bit 'intimidated' when you came on the walk...no wait...let me tell you why. You know Bombay. You know Fort. You know food. You do food. All I can say is thanks so much for reposing your faith in me by coming for the walk and for sharing memories of little Rhea coming to Fort with her dad. I had a super time Kalyan. I might know food and Fort but there's still loads that I can still learn :) Looking forward to the next walk. Hahaha Kurush....I am enjoying reading this post again and everyone's account,after having gone on the walk myself! Lovely post, Rhea. I have been a silent reader of your blog, but just had to leave a comment on this one! I was introduced to Yazdani by hubby about a decade back, and have been a regular since then. Now my son is hooked too and we absolutely love their apple pies! Kiddo's presence nearly always results in conversations with the older patrons and the owners and each visit is a memorable one. Now reading your post, I wish I could go and see the inside too!!! Guess I will have to wait for a chance to go on one of Kalyan's walks!! !